Cloud computing still presents the single biggest opportunity for enterprise companies today. Even though cloud-based solutions have been around for more than 10 years now, the concepts related to cloud continue to confuse many. Of late, it seems that Hybrid Cloud and Multi-Cloud are the latest concepts creating confusion. To make matters worse, a number of folks (inappropriately) use these terms interchangeably. The reality is that they are very different. 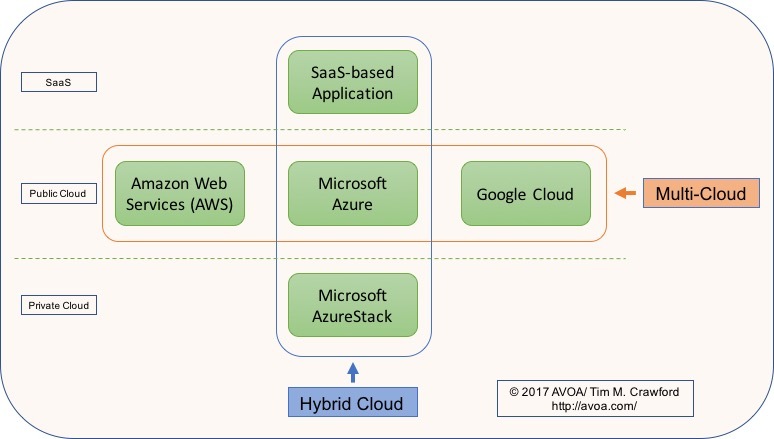 The best way to think about the differences between Hybrid Cloud and Multi-Cloud is in terms of orientation. One addresses a continuum of different services vertically while the other looks at the horizontal aspect of cloud. There are pros and cons to each and they are not interchangeable. Leverage: Enterprise IT organizations are generally risk-adverse. There are many reasons for this to be discussed in a later post. Fear of taking risks tends to inform a number of decisions including choice of cloud provider. One aspect is the fear of lock-in to a single provider. I addressed my perspective on lock-in here. By using a multi-cloud approach, an enterprise can hedge their risk across multiple providers. The downside is that this approach creates complexities with integration, organizational skills and data transit. Best of Breed: The second reason enterprises typically use a multi-cloud strategy is due to best of breed solutions. Not all solutions in a single delivery tier offer the same services. An enterprise may choose to use one provider’s solution for a specific function and a second provider’s solution for a different function. This approach, while advantageous in some respects, does create complexity in a number of ways including integration, data transit, organizational skills and sprawl. Evaluation: The third reason enterprises leverage a multi-cloud strategy is relatively temporary and exists for evaluation purposes. This third approach is actually a very common approach among enterprises today. Essentially, it provides a means to evaluate different cloud providers in a single delivery tier when they first start out. However, they eventually focus on a single provider and build expertise around that single provider’s solution. In the end, I find that the reasons that enterprises choose one of the three approaches above is often informed by their maturity and thinking around cloud in general. The question many ask is: Do the upsides of leverage or best of breed outweigh the downsides of complexity? Most, if not all, enterprises are using a form of hybrid cloud today. Hybrid cloud refers to the vertical use of cloud in multiple different delivery tiers. Most typically, enterprises are using a SaaS-based solution and Public Cloud today. Some may also use Private Cloud. Hybrid cloud does not require that a single application spans the different delivery tiers. The important take away from this is to understand how you leverage Multi-cloud and/or Hybrid cloud and less about defining the terms. Too often, we get hung up on defining terms more than understanding the benefits from leveraging the solution…or methodology. Even when discussing outcomes, we often still focus on technology. These two approaches are not the same and come with their own set of pros and cons. The value from Multi-Cloud and Hybrid Cloud is that they both provide leverage for business transformation. The question is: How will you leverage them for business advantage? Tim, I have pleased to about the difference between Hybrid and Multi-Cloud for the Enterprise! Great article thanks and keep it up!